Interactive Introverts (also known by its abbreviated form II) was Dan and Phil's second stage show and world tour. It started on April 25th 2018 in Brighton, United Kingdom and it ended on September 21st 2018 in Mumbai, India. The show will be released on DVD in December 2018 and special premiere will be held on November 28th 2018 in São Paulo, Brazil. On November 10th 2017 Dan and Phil announced on social media that they would be going on another world tour in 2018. All tour dates were posted on their website danandphiltour.com that same day, with a few dates still to be confirmed. On November 14th 2017 tickets for most dates went on sale, and a trailer was posted on Dan's main channel. On July 22nd 2018 a second trailer was posted on the Daniel Howell channel to promote the second half of the tour. It uses footage from one of the UK shows. The shows in Philadelphia and St. Augustine were added later on February 26th 2018. The Singapore, Hong Kong, and Mumbai dates were confirmed on March 27th 2018. Tickets went on March 29th 2018. On July 18th 2018 Phil announced that the TBC date in Montreal would not be happening. The exact reason for this is unknown. The dates in Brazil and Mexico ended up not happening, but kept being listed as TBC until November 8th when Dan and Phil announced in a liveshow that they would come to the two countries for the launch of the Interactive Introverts DVD. The Mexico date got cancelled a few days later in another liveshow on November 11th. On November 16th it was announced that the official premiere of the Interactive Introverts movie would be happening in São Paulo, Brazil on November 28th at Teatro Opus. 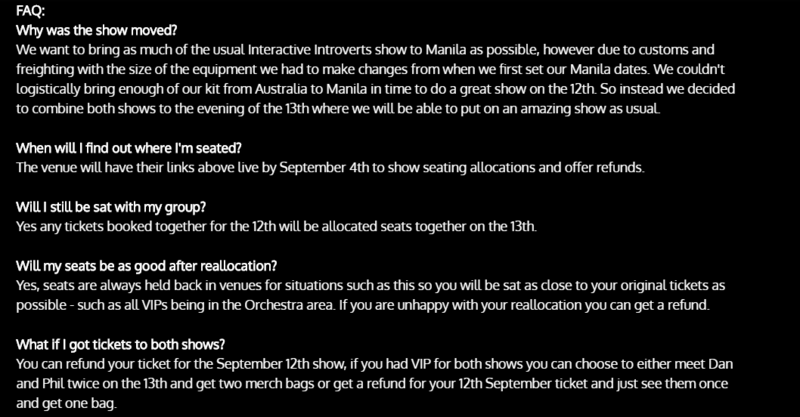 On September 1st it was announced that the Manila show on September 12th 2018 was cancelled due to technical and logistical issues. All people who had bought tickets for that show would automatically get a seat at the show planned for the 13th. People who wouldn't be able to attend that show or didn't want to could get their ticket refunded. On April 22nd 2018 'A Week in the Life of Dan and Phil!' was uploaded to AmazingPhil. It documents them during a week of rehearsals in London before the start of the tour. Dan and Phil started doing Instagram Stories while on tour. The first ones were uploaded on April 25th 2018 and they can all be watched on IDB's YouTube channel.